This chart graphs foods based on how full they make you and whether or not they give you a sugar high (and subsequent sugar crash). Post it on your fridge to remind you to reach for oranges or apples instead of bananas, eggs instead of cereal. It’s always grilling season, isn’t it? Keep this chart handy by your grill to get the timing right for meats and veggies. They’re approximate times and temperatures, but that’s still a whole lot better than just winging it. Spoiled food is a terrible waste—of our money and, obviously, fresh food. Without guides like these, though, it’s hard to know how long foods will lastbefore you have to throw them out. The chart identifies the “prime” storage time for various foods, on the counter, in the fridge, or in the freezer. Many of us aren’t eating enough of different produce to reap their benefits. This graphic offers suggestions for getting your fill of each color, the benefits you can expect from doing so, and other miscellaneous facts like sneaking more “greens” in your diet with green tea. Having a well-stocked pantry could mean all the difference between being able to whip up a quick meal or entertain last-minute and having to run to the grocery store or order out. 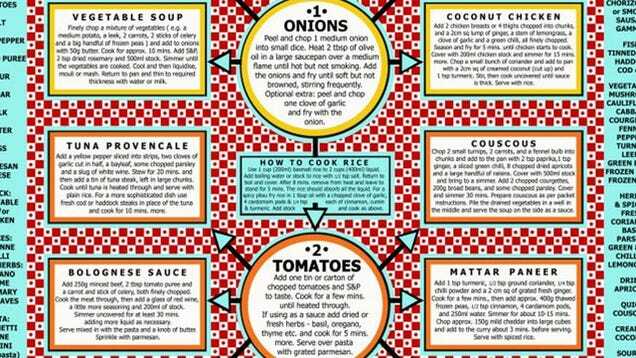 This flowchart/graphic turns pantry staples into multiple meals. No matter how well you think you’ve stocked your pantry, though, there’s a chance you’re working with a recipe that calls for something you just don’t have on hand. I mean, who has an endless supply of fresh buttermilk in their fridge? This graphic offers substitutions for common and uncommon ingredients. You’ve got kitchen/household scraps. Can you turn them into gardening gold instead of garbage? Instead of tossing food out, check out this graphic which highlights the many trash-headed items that could be used instead to improve your garden—even dryer lint, hair/fur, or fireplace ashes. Perhaps the most important tool in your kitchen, the knife is one instrument you’ll want to master. This graphic highlights the differences between different knives, the different kinds of cuts you might want to use, and more knife-y tips. Want just one cheat sheet to cover lots of cooking and shopping territory? Here you go. Useful for on your fridge and/or while selecting something to cook.